Oliver Stone is an award winning director and screenwriter who is known for films such as Scarface, Wall Street, Platoon, Natural Born Killers, JFK, and a ton of other awesome movies. Depending on your age and location, it is highly likely that you have seen an Oliver Stone movie at some point in your life. I have published two articles in the last couple of weeks about celebrity domain names expiring. BobCostas.com and JackNicholson.com expired within a few days of each other, and it appears that both were renewed. I did a bit of searching on Archive.org, and it didn’t seem like either of those domain names was developed. 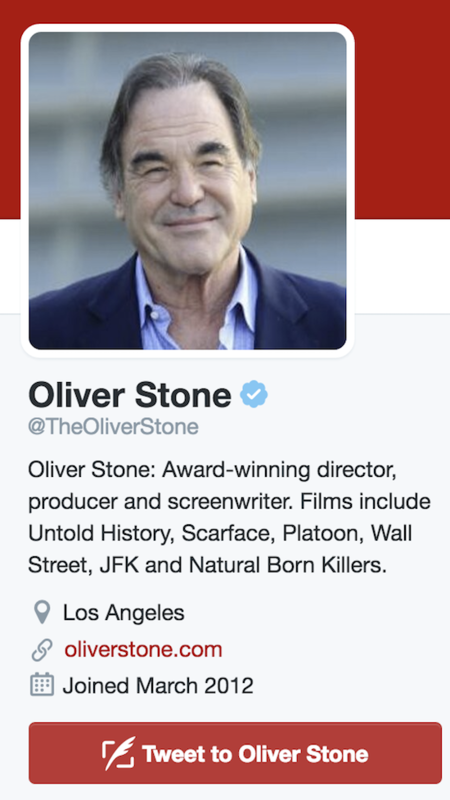 Archive.org shows that OliverStone.com had been a developed website with information about Mr. Stone. It looks like the title of the website when it was live was “The Oliver Stone Experience.” According to a DomainTools Whois History Tool search, it looks like the domain name was registered to a Universal / NBC affiliated entity prior to its expiration. As of the time of publication, there are quite a few backorders for this domain name. The backorder deadline is at 11pm tonight (eastern time). Why couldn’t this have happened to John Stamos instead? Actually the .com was finally secured last year and it’s good till 2019. Have a fine Thanksgiving Elliot. These days anyone who’s anyone can’t be caught not letting their domain expire.